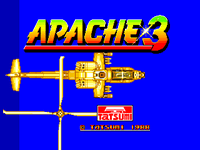 Publisher: Tatsumi Electronics Co., Ltd. Developer: Tatsumi Electronics Co., Ltd. Play an Apache Helicopter attempting to rescue prisoners while shooting and avoid being shot by various other planes, helicopters and ground troops. Scrolls differently on varying levels.